Pilot: Fall TV has finally swung in and one of the first new series is NBC's This Is Us. It may be a bit early to declare it, but Dan Fogelman's new series has the potential to be the next Parenthood. The pilot was smartly written with authentic dialogue and acutely genuine emotions as the family drama unfolds and the emotions are wrung out of the audience. Of course, this would not have been possible if not for the great cast who were perfectly cast and embodied their characters so well. 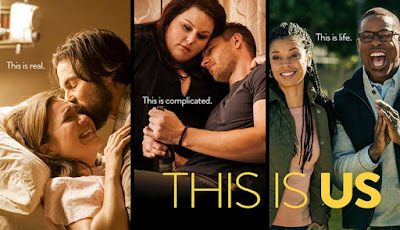 Milo Ventimiglia has come a long way since his days as Jess in Gilmore Girls and in Heroes; Justin Hartley is a handsome revelation and Chrissy Metz is an heartache. Sterling K. Brown gave a great performance but his character was still a bit of a cipher. As was Mandy Moore who did not get much to do this time. The ending gave us a little twist that was, in my opinion, kind of expected but it really does open up many exciting storytelling potentials! Looking forward to the next few episodes. Episode #2 - "The Big Three": The show continues on on its charming, touching and downright heartwarming course as the framework of the series begins to take shape. The relationship between Kevin, Kate and Randall is very interesting and has so much potential for exploration. On the other hand, in the past, Rebecca and Jack's story seemed to be sacrificed and was presented as lean as possible. Nonetheless, Mandy Moore and Milo Ventimiglia nailed their scenes. Ken Olin directed this episode (he is also the producer), maybe one day he will guest star in it too. Speaking of which, Katy Sagal and Brad Garrett slayed their moments! A word of caution though: This Is Us needs to stay clear of having way too many last minute, episode ending twists.